A highly focused or "directional" acoustic source offers the advantages of reducing noise interference, increasing the detection resolution, and enhancing sound intensity in the direction of interest. However, high directivity also requires an acoustic projector of large size in comparison with the wavelength, or high-frequency sound beams. Most sonar sources consist of large arrays, and the total size of the arrays is much larger than the wavelength. This problem is known as the size-wavelength limitation. While this problem plagues man-made sonar, Yangtze finless porpoises don't seem to have the same limitation. Through millions of years of evolution and natural selection, the animal has developed a relatively small head (compared to man-made sonar) that can manipulate acoustic waves into a beam with high directivity. Porpoises and dolphins use these highly efficient biosonars for foraging, avoiding predators, and group coordination. Studies have shown that, despite serious vision degradation in water, dolphins can locate centimeter-sized objects 100 meters away using echolocation. Now a team of researchers from Xiamen University and the Institute of Hydrobiology of the Chinese Academy of Sciences in China, as well as The Pennsylvania State University in the USA, has designed and constructed a biomimetic sonar projector based on dolphin biosonar that achieves high directivity with a subwavelength sound source, overcoming the size-wavelength limitation. Their work is published in a recent issue of Applied Physics Letters. "The biomimetic projector breaks the size-wavelength limitation of traditional man-made sonar systems and provides a new concept for the realization of directional acoustic devices in the subwavelength regime," coauthor Wenwu Cao, Professor at The Pennsylvania State University, told Phys.org. "[Before now,] the compromise in size or frequency has inevitably brought many serious problems, including large physical size for low-frequency sound beams, high power consumption, and strong attenuation at high frequencies that reduces the detection distance," he explained. "Therefore, it is important to be able to operate a directional sonar in the subwavelength range, which allows the sonar device to be made in small size with high resolution." The researchers' work builds on their recent computed tomography (CT) studies of the complex structure of dolphin biosonar. The CT results show that the Yangtze finless porpoise has three main acoustic elements in its head: a skull, melon (fatty tissue), and air sacs. 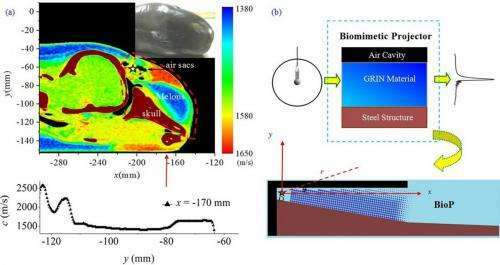 The researchers designed elements to mimic each of these features: a steel structure to mimic the skull, a gradient-index material to mimic the melon, and an air cavity to mimic the air sacs. "These three elements collectively could manipulate the omnidirectional wave generated from a subwavelength source into a highly directional one," said Yu Zhang, project leader and Professor at the Key Laboratory of Underwater Acoustic Communication and Marine Information Technology of the Ministry of Education, Xiamen University. 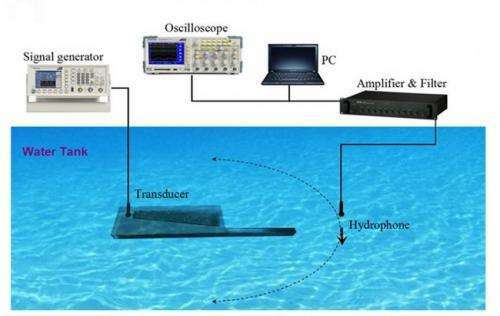 By successfully mimicking a dolphin's acoustic elements, the researchers could achieve a very high-performing sonar system using a single sound source. Experiments and simulations showed that the bio-inspired sonar system could have both a miniature size and high directivity, breaking the size-wavelength limitation. Compared to the traditional strategy of using a horn for making directional beams with a bare subwavelength source (without all of the dolphin-inspired acoustic elements), the new biomimetic projector has superior angular resolution by an order of magnitude, in addition to other advantages. As it does not require complex circuitry, such a sonar system also has low energy consumption and very low cost. These properties make the bio-inspired sound projector promising for applications in underwater sonar, medical ultrasound, and other related areas. The researchers also want to investigate what happens when part of a dolphin's biosonar is damaged. "In the future, we will focus more on the function of each component and the physical mechanism of beam focusing using gradient materials," Cao said. "In principle, a dolphin's acoustic structure should affect its biosonar function. But, we found a dolphin with partially damaged acoustic structure that lives independently and is able to avoid vessels, which suggests its echolocation ability is still intact. Our next goal is to find out why such acoustic structure damage did not cause catastrophe in the dolphin's life. In addition, the biomimetic structure will be further optimized using artificial materials having an impedance gradient much larger than in the dolphin bisonar system. Hopefully we could apply the principle of the research finding to build better sonar systems in the near future." "The researchers also want to investigate what happens when part of a dolphin's biosonar is damaged." Cue the scientific dolphin harvesting... I doubt the dolphins are going to enjoy this. I wonder if some kind of analog could be developed for electromagnetic radiation. Could have some tremendous benefits.